No need to pitch a tent at these luxury glamping resorts! 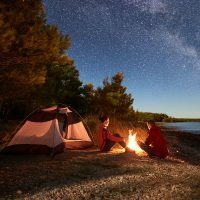 Glamping — glamorous camping — lets your family combine the luxuries of a fancy, furnished cabin or treehouse with the fun traditions of camping — sing-alongs, campfires with S’mores and more. Try something different with a stay at one of these luxury glamping resorts for families. 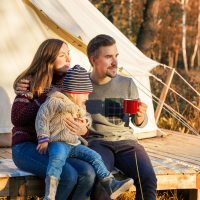 Located only minutes from Dallas/Fort Worth, this Texas family glamping resort features horseback riding, hiking trails, Jeep tours, an outdoor pool, spa treatments and authentic Texas cuisine that the whole family will love. 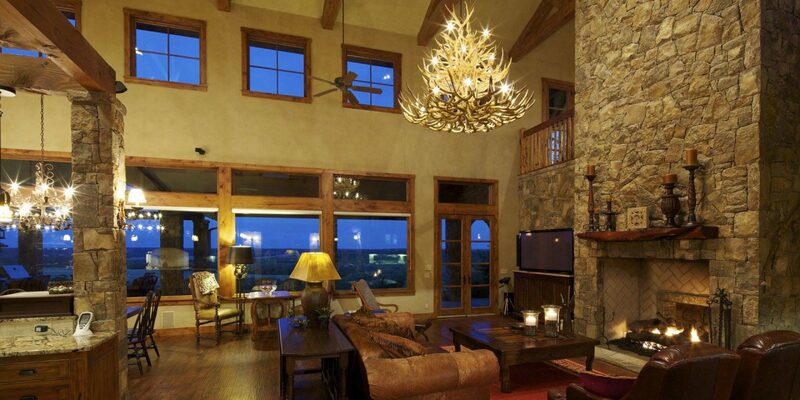 Wildcatter Ranch Resort & Spa features cabin suites, hotel guestrooms and an entire homestead cabin. The cabin suites with a Western-style decor feature king beds, hardwood floors, fireplaces and a front porch with rocking chairs. The hotel guestrooms are more typical of your average hotel guestrooms with two queen beds and bathroom so if you're really looking to stay inside, this is your best option. The homestead cabin is top notch, featuring a large living room with a fireplace and flat-screen television and a fully equipped kitchen with a full-size refrigerator, oven, microwave and dishwasher. Plus, there is an adorable front porch with rocking chairs overlooking the beautiful views. If you want to enjoy the outdoors during the day but close your door to the bugs at night, this luxury glamping resort is suitable for your family. This luxury glamping resort located in western Canada may be remote and open seasonally, but the "tents" here are nowhere near your average pop-up tent. Families arrive via floatplane and are then escorted by horse-drawn wagon to one of the 25 guest tents. The Deluxe Family Tents (which can sleep up to five people) feature a king bed and a queen-sized sleeper sofa (which sits on hardwood floors), a sink, toilet and shower and a private deck. For the authentic camping experience, the tent walls and ceiling are canvas and there are vintage oil lamps, candles and a propane-fueled "wood" stove. But don't worry, there are outlets for hairdryers and charging devices, too! Free Wi-Fi is available in the tents but not in the dining tents or spa area. Families can enjoy the lake, fishing, horseback riding, hiking, boating or even take a helicopter tour. Families are definitely camping at Clayoquot Wilderness Resort but in ultimate luxury. The accommodations at the Rocking Horse Ranch are considered AAA three diamond. Families will find queen beds and bunk beds for the kids inside the lodge rooms. A flat-screen television, mini-fridge and free Wi-Fi are also available in the rooms. Some of the guestrooms can easily accommodate up to six people as well. This glamping resort is all inclusive, so the luxury here is in what is included in your stay. All meals, horse adventures, an indoor water park, water sports on the lake, a kids' club, spa and so much more are included at this luxury glamping resort. This Colorado dude ranch offers luxury glamping at its finest. The cabins at 4UR Ranch offer a picturesque view from the porch. Families can sit on the porch swing and enjoy the mountain views before heading off for an outdoor activity. Families will love the outdoor pool, spa, hiking and biking trails, river rafting, horseback riding and of course, the kids program. At this glamping resort for families, the kids can learn what it takes to run a ranch. They will help with the animals, do arts and crafts, play games, go horseback riding and overall just enjoy nature. There is even a kids' rodeo competition where they all learn the ropes of camping! There is so much to experience at The Resort at Paws Up, we don't even know where to start! The 37,000-acre resort offers horseback riding, fly-fishing, river rafting, paintball wars, hot air balloon rides, ATV tours, a kids' club, authentic chuck wagon rides, archery and much, much more. 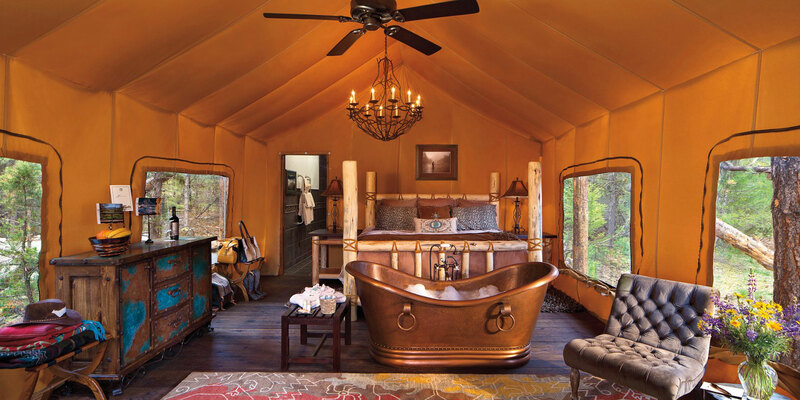 Perhaps the best part, though, are the luxury glamping accommodations, including cabins, campsites, and, added in 2017, North Camp -- the resort's most luxurious glamping experience to date. North Camp features two- and three-bedroom tents with ensuite bathrooms and luxury furnishings and amenities. The tents can accommodate between two and six people and feature breathtaking Montana views just outside their doors. Your camp butler will be happy to start the campfire when it's time for S'mores! The large, luxury cabins (more like full homes), feature one, two or three bedrooms and fully equipped kitchens. 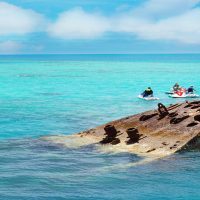 They can sleep between four and eight people. This luxury camping option is the furthest thing away from roughing it! Located on Florida's panhandle about an hour north of Destin, this family glamping resort perfectly meshes nature with luxury. Twin Lakes Camp Resort is situated between King Lake and Holley Lake. The canvas cottages feature wooden floors, a king bed and a bathroom with a claw-foot tub. Families will also find air conditioning and heat, a microwave, mini-fridge, coffeemaker and television inside the tent. The lake views are wonderful to wake up to and the fire pit is a great spot to end an evening with the family. Located about 90 minutes south of Kissimmee, Florida, this luxury glamping resort is situated on 1,700 acres along the Kissimmee River. The kids will love watching the Saturday night rodeo and then can get to know their own horses on a horseback riding adventure. The luxury glamping tents at Westgate River Ranch are set on a platform with a king bed and two twin beds so the whole family is comfortable. The tents feature air conditioning, a patio with mosquito net and two rocking chairs, a microwave and mini-fridge. The bathroom is a short walk away from the tent and guests are given a key to their own private bathroom and shower. This luxury glamping resort also comes with a personal glamping concierge who is ready to light a campfire, open a bottle of wine and tell a ghost story.